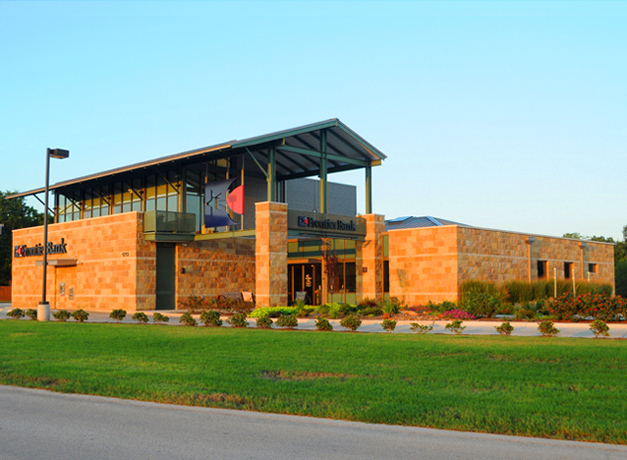 Located at a highway intersection on the edge of Elgin’s downtown, the 10,000 square foot building serves as the first location and home office of a hometown Texas bank. The building’s ground level encompasses the normal bank functions including the double-height banking hall, bank staff offices, safe deposit vault, and back-of-house operations facilities. The upper level contains the bank’s Board of Directors conference room as well as the Community Room, an assembly space with adjacent catering kitchen accommodating up to 120 people for use by Elgin’s community organizations. The Community Room’s assembly space is extended by a covered outdoor terrace. The broad wing-like roof over the Community Room and its terrace references the bank’s Elgin heritage and is a prominent architectural landmark on approach from the highway.